Black Mouth Curs are versatile hunting, guarding and even cattle dogs originating in the South-Southeastern region of the United States. They are low maintenance, easy to train and make excellent family companions due to their gentle, eager-to-please natures. This breed is medium-large sized and not hypoallergenic. Ideally, to own one of these dogs you should have a job for them to do, plenty of time to spend exercising them, and plenty of land for them to roam. BMCs are very healthy dogs that typically live 14-16 years. Mountain curs are squarely proportioned and possess great agility and athleticism. They are so names because their squarish muzzle is often black along with their black lips (and usually inside the mouth, too). BMC's have high-set, medium sized ears that drop down and attractive eyes that can be brown, yellow or even green. The coat of this breed is shorter than that of the Mountain Cur and can be fine or rough and comes in quite a few shades with yellow being very popular (see color section). The tail can be naturally bobbed or long. Overall, this is a medium-large sized versatile working dog. BMCs are very intelligent and eager to please, making them easy to train if you are an experienced dog owner. If not, establishing yourself as the authority is imperative; firm, consistent commands with plenty of praise, affection and treats for good behavior will work perfectly for this sensitive breed. Black Mouth Cur information is all pretty much in agreement that this breed needs little training for its duties (hunting, herding, protecting). Early socialization is a must so he/she will not become overprotective. Members of this breed make excellent family companions-- they are gentle and playful with kids and have strong protective instincts in regards to their property and family. Typically social and friendly with other dogs, homes with cats and other small pets are not suitable for their high prey instincts. This breed needs daily human companionship and may bark excessively when bored, otherwise these dogs are fairly quiet. BMCs need 1-2 hours of daily exercise and may get bored and anxious without it. They are natural hunters and are excellent for treeing, hunting small game, herding cattle and even hunting large game. Their natural athleticism also makes them appropriate companions for runs, hikes, and even swims! Some of these dogs also excel at weight pulling. The Black Mouth Cur history is not completely certain. Historians' assumptions are that British, Irish, and Scottish settlers brought their native dogs with them, and that these dogs often mingled with Native American Cur-like dogs to produce many separate Cur breeds. Since these dogs were hunting companions and guardians of settlers moving into America, they migrated into many different areas of the South and Southeast. Different strains of BMC's have emerged over the years (some claiming to be superior to others) with the most famous of these being the Ladner Yellow Black Mouth Cur which originated in the Mississippi Gulf Coast area. The Southern Black Mouth Cur of Alabama as well as the Florida and Texas Black Mouth Curs are other such varieties. Note that different types may be better known for different duties-- for example, the Texas Black Mouth Cur is very useful for herding cattle. The National Kennel Club was the first to recognize this breed in 1964 through the efforts of LH Ladner who had kept such excellent records of his breedings, the NKC gladly accepted the Black Mouth Cur as a distinct breed. Black masks and muzzles are acceptable and common. White should be limited to less than 10% of the coat and is usually found on the neck, chest,and legs as well as under the chin, near the nose and on the tail's tip. Black Mouth Curs are versatile hunting companions that are bred more for intelligence and functionality than for any standard "look". However, one of the most frequent questions is "How big does a Black Mouth Cur get?" so, in general, male weight should be a minimum of 40 pounds (females 35). Height at the shoulders should be a minimum of 16" for females and 18" for males; these measurements usually put the Black Mouth Cur size in the "medium" category, although some can reach large stature. Different sizes have different purposes for this breed. Smaller BMCs are favored for small game hunting, varmint extermination and treeing while larger BMCs are more suited for hunting medium-large game and cattle herding. The BMC personality lends to him being an excellent family companion but also good for the solitary hunter. They get along well with other dogs and livestock animals but may retain high prey instincts towards smaller pets or creatures such as cats or varmint and small game (squirrels, raccoons, foxes, etc.) They excel at may athletic events besides hunting such as: running, hiking, weight pulling, ball games, and even swimming; 1-2 hours exercise and an ample sized property is necessary to avoid destructive, anxious behavior. They also need plenty of daily family/owner interaction. These dogs are very protective and should be trained and socialized early so as not to be overly reactive in non threatening scenarios and to behave well around visitors. In the hands of an experienced dog owner this breed will be a breeze to train--they are very eager to please. However, a word of advice to the newbie: establish yourself firmly as the pack leader and let them know they are at the bottom of the family "pack". Firmness, consistency along with praise and affection is key since these dogs are quite sensitive to your tone and attitude. 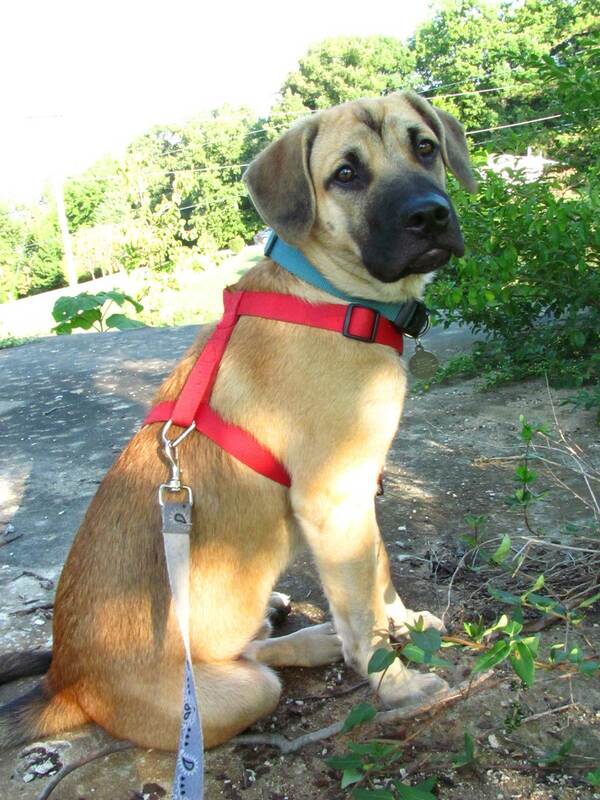 A well socialized Black Mouth Cur makes an excellent family companion. They bond closely and lovingly with the family and do not enjoy spending the majority of their time alone. Their high energy requirements and athletic aptitude make them very suitable playmates. Although a fierce hunter, they are gentle with children and will keep an ever-vigilant watch over them. At the same time, these dogs may grown to medium-large size so toddlers/babies and Black Mouth Curs should always be supervised. 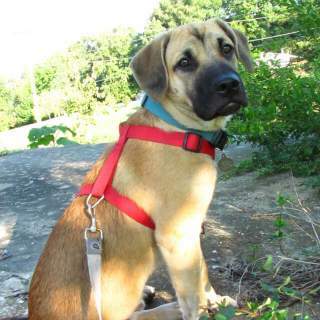 Below are pictures and images of the Black Mouth Cur dog breed. If you want a healthy and low maintenance dog, the Black Mouth Cur is certainly an excellent contender. They are a very robust breed that, if given plenty of exercise, will remain in good health; this may be due to them being bred for functionality more than appearances. Do keep their ears clean and dry though, especially if they spend time in/around water or wetlands-- they may easily develop ear infections. Although we can't predict the lifespan of every dog, Black Mouth Curs consistently live 15-16 years. As with all breeds, don't skip the routine veterinary check ups since these are key to detecting and preventing any serious issues. When purchasing from a breeder, ask for proof of health for both the parents and the puppy.